InterSystems IRIS automatically writes these to the Event Log. InterSystems IRIS also automatically writes these to the Event Log. Trace items are meant for debugging and diagnostic purposes. You can use these, for example, to locate program errors before deploying the production. InterSystems IRIS can write these to the Event Log, to the Terminal, or both. The OnProcessInput() method of business services and the OnMessage() and other user-written MessageMap methods of business operations are wrapped by the production framework, so that you do not need to include any additional error trapping in your code. If the property specifies the VALUELIST parameter, the setting is displayed with a drop-down list. The items that will appear in the drop-down list must be separated using a comma as the delimiter. InterSystems IRIS uses the general-purpose selector component, which you can also use; to do so, specify control as selector and then append property/value pairs. Note that the selector component also has a property named multiSelect. By default, the user can select only one item. To enable the user to select multiple items, include a property/value pair as follows: multiSelect=1. These examples use InterSystems IRIS classes. Many of these examples use the Ens.ContextSearch class, which provides a large number of useful methods. If this list does not cover your scenario, see the class documentation for Ens.ContextSearch to determine whether any of the existing methods supply the data you need. If that class does not cover your scenario, you can create your own subclass of Ens.ContextSearch. The values defined for the InterSystems IRIS instance, but stored outside the production. For information, see “Defining Production Defaults” in Configuring Productions. You can develop your production to have configuration settings come from different sources. The primary purpose is to make it easier to move productions from one InterSystems IRIS instance to another, such as from test to live. Once you define a production, you can change the source of both production and business host settings on the Production Configuration page of the Management Portal. See Configuring Productions for details. The use of default settings allows you to define production and business host settings outside the production definition where you can preserve them during a production upgrade. To facilitate updating productions or moving productions from one system to another, you can omit settings and take their values from a structure that is installed on the system. When a setting is missing, InterSystems IRIS retrieves the default setting from outside the production definition if one exists. For details about $GET, see the ObjectScript Reference. In addition to the straightforward alternatives of synchronous (wait) and asynchronous (do not wait), it is possible to send messages outside InterSystems IRIS using a mechanism called deferred response. 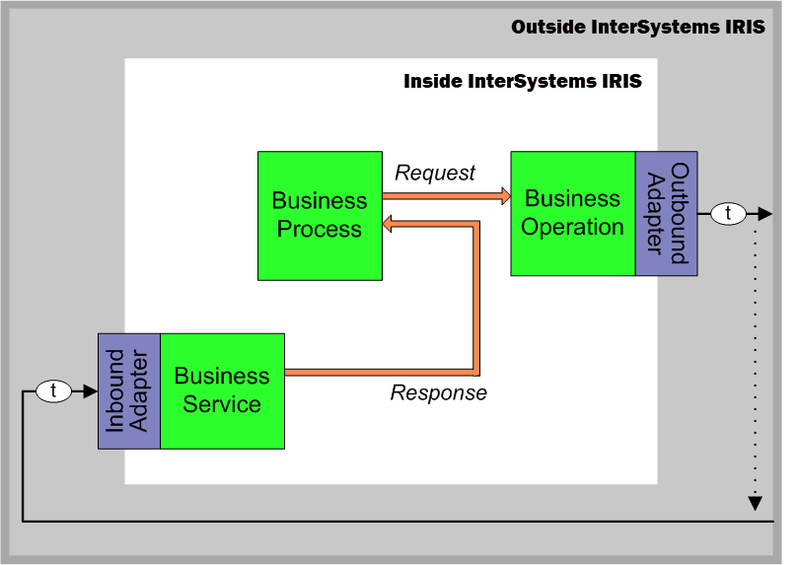 Suppose a business process wishes to invoke an action outside InterSystems IRIS. It sends a request to a business operation, which performs the invocation and returns the response. The business process is the intended recipient of any response; the business operation is simply the means by which the request goes out and the response comes in. The business operation will relay a response back if the business process made the request synchronously, or if it made the request asynchronously with asynchronous response requested. The following diagram summarizes this mechanism. A business operation defers a response by calling its DeferResponse() method to generate a token that represents the original sender and the original request. The business operation must also find a way to communicate this token to the external entity, which is then responsible for including this token in any later responses to InterSystems IRIS. For example, if the external destination is email, a business operation can include the token string in the subject line of the outgoing email. The entity receiving this email can extract this token from the request subject line and use it in the response subject line. In the following diagram, the item “t” represents this token. An incoming event in response to the request can be picked up and returned to the original sender by any business host in the production. Exactly where the event arrives in an InterSystems IRIS production depends on the design of the production; typically, it is the task of a business service to receive incoming events from outside InterSystems IRIS. The business host that receives the incoming event must also receive the deferred response token with the event. The business host then calls its SendDeferredResponse() method to create the appropriate response message from the incoming event data and direct this response to the original sender. The original sender receives the response without any knowledge of how it was returned. The following figure shows a request and its deferred response. Modify the applicable parts of the production (typically business host classes) to generate Event Log entries in ObjectScript, as described in the following subsection. If you need to notify users actively about certain conditions or events, use alerts, which are discussed in the next section and in “Defining Alert Processors,” later in this book. An alert sends notifications to applicable users while a production is running, in the event that an alert event occurs. The intention is to alert a system administrator or service technician to the presence of a problem. Alerts may be delivered via email, text pager, or another mechanism. All alerts also write messages to the InterSystems IRIS Event Log, with the type Alert. You might see $$$sysTRACE in InterSystems IRIS system code, but the appropriate choice for your own business host classes is generally $$$TRACE. To write user trace messages in a BPL business process or in a DTL data transformation, use the <trace> element. See the Business Process and Data Transformation Language Reference or the Data Transformation Language Reference.